Row I L to R: John Caughey, Manager, Vincent Quinn, Gipps President, Ivan Durflinger, Coach. Row 3 L to R: Pat Cusack, P.L. Garrison, Jr., Fred Allen, Ray Zimmerman, Fred Barnewolt, Stan Wallace, Coach. Inserts: Ray McQuerry (I), Al Fuhrman (r). IN A PEORIA SPORTS ERA when fast pitch softball was a major item, a talented bunch of teenagers brought a national championship to our town. 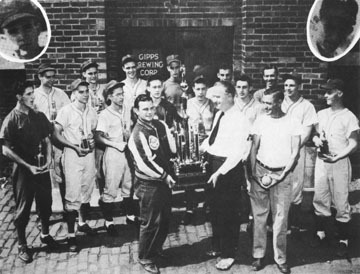 The Gipps Jr. All-Stars, in the second and final year of their existence, won the National Junior tournament in St. Joseph, Mo., in 1947. Put together and coached by the late Johnny Caughey, the Gipps All-Stars were comprised of athletes from Manual, East Peoria, Morton, Spalding and Woodruff high schools. 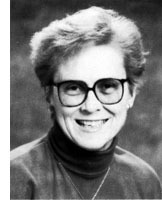 Caughey, involved with softball for many years, had acally fielded his first junior team the year before, finishing second in the national tournament when his young team played nine games in three days. A year later, again honing their skills by playing a regular season schedule against adult teams at a time when Peoria was filled with outstanding clubs, the team hit the jackpot. After playing a 30-game regular season schedule, it was ready for the junior nationals and, in order, whipped Topeka, Kan.; Old Hickory, Tenn.; Pocatello, Idaho; Little Rock, Ark. ; Midland, Mich; and then downed Whittier, Calif., 3-2 in the title game.